V. conspersa of Michigan Flora. Deciduous, mixed, and coniferous forests and swamps, usually in moist ground and often in slightly disturbed areas such as rocky ridges, trailsides, clearings; sometimes in open ground, especially at borders of forests and shores. The leaves are quite variable on the same plant, the lower ones often ± reniform. The spurs may be a little longer than 5 mm, if the other petals are also unusually large, so that the spur is still no longer than the petals, unlike V. rostrata. The leaves are rather pale or even yellowish green and thin in texture compared to those of V. adunca. Rarely the flowers are pure white. Hybridizes occasionally with V. rostrata to form V. ×malteana House; intermediate in appearance, most noticeably in spur length, with the lateral petals bearded. 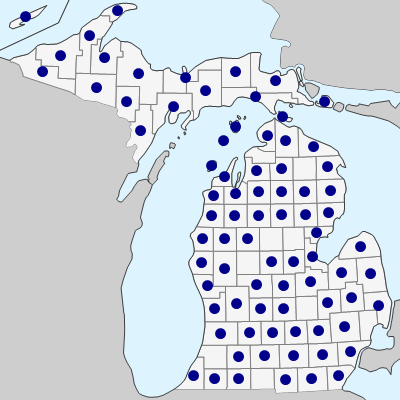 They have been collected in Antrim, Clare, Emmet, Isabella, Kalamazoo, Midland, Osceola, Sanilac, Tuscola, and Wayne Cos. Hybrids of V. labradorica × V. striata (V. ×eclipes H. Ballard) have been collected in Berrien, Cass, Ingham, Lenawee, Macomb, Midland, Monroe, Sanilac, Washtenaw, and Wayne Cos. These are rather like V. rostrata, but with clearly shorter spurs. MICHIGAN FLORA ONLINE. A. A. Reznicek, E. G. Voss, & B. S. Walters. February 2011. University of Michigan. Web. 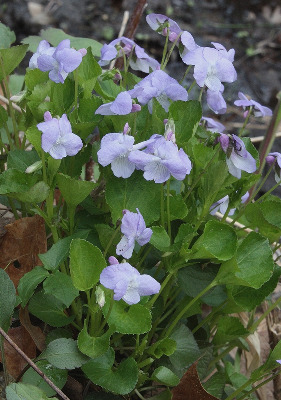 April 19, 2019. https://michiganflora.net/species.aspx?id=2781.